From the creator of the Mana series. 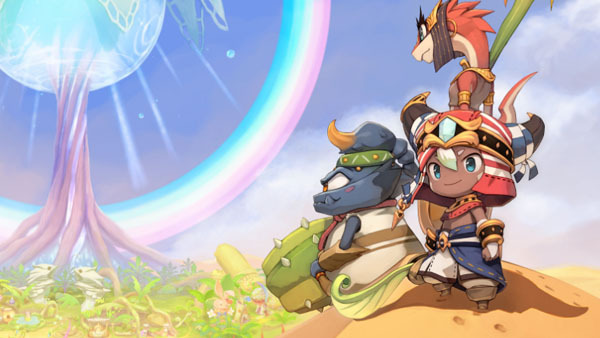 Nintendo and Japanese developer Grezzo, founded by Mana series creator Koichi Ishii, announced Ever Oasis, a new action RPG for 3DS due out in 2017, during the Nintendo Treehouse Live at E3 2016 live stream. Directed by Ishii, Ever Oasis takes place in the desert. The main character is the leader of the oasis, and with his partner Isuna, a water spirit, he goes on an adventure in hopes to develop the oasis. But there many challenges he must face. The main character will develop as he overcomes these challenges through the friendships he cultivates, and through it all will find his own path. In the vast desert, we must band together to uncover its secrets. With Isuna at your side, create your very own oasis! Welcome new wanderers from far-off tribes! Venture into the desert to forage, battle, and discover! Team up with wanderers to explore dungeons! Use Green Gale and other skills to tackle puzzles on your journey! Strategically defeat enemies by switching allies! Protect that which you hold dear! Get the trailer, gameplay, and fact sheet below. View the first screenshots at the gallery. From the team behind The Legend of Zelda: Majora’s Mask 3D comes a daring new adventure that expands on everything RPG fans love about the genre. As a chosen Seedling, your mission is to build a prosperous oasis by working with your partner, Isuna. Meet and ally with members of other tribes to complete your mission, while battling against the Chaos threatening peace in the desert. Battle enemies in real-time combat as you switch between three party members and explore a savage desert. Forage for materials in caves and puzzle-ﬁlled dungeons to earn dewadems, which are used to grow new shops and even grow gear! Developed by Grezzo Co., Ltd., the team behind The Legend of Zelda: Majora’s Mask 3D.